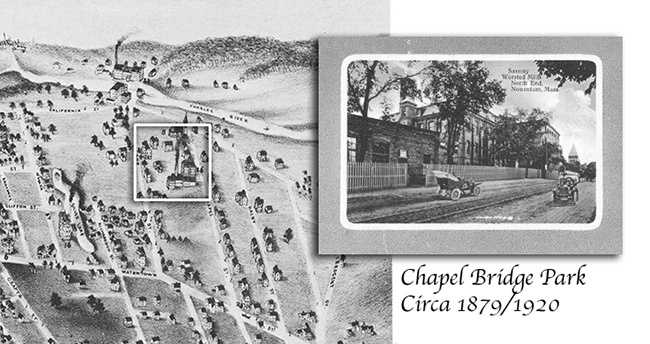 Our History : Chapel Bridge Park | A State-of-the-art business campus just minutes from Boston. Chapel Bridge Park has a rich history, dating back to the 1850s, when Englishman Thomas Dalby founded a stocking and hosiery mill here, and constructed the oldest building in the complex at 57 Chapel Street. Nonantum Worsted purchased the mill after the civil war, converting it to a production facility for wool yarn and worsted cloth, and constructing the building at 55 Chapel Street. The company was highly successful, employing hundreds of workers to run its steam-powered spinning machines. In 1896, the Saxony company purchased the business and extensively rebuilt and enlarged it. As the textile industry declined in the 1920s, Raytheon Corporation bought the property, and it served as a high technology manufacturing and R&D facility. In 1965 Chapel Bridge Park Associates purchased the land and buildings, and established its ongoing commitment to renovating and improving the park.